Audio (mp3); Variations for Violin & Piano. Recording of the entire work from 1984, performed by Bruce Corlett and Matthew Davidson. 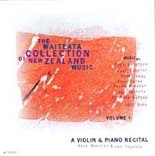 Variations for Violin and Piano was written in 1982 while Nigel Keay was studying composition at Victoria University of Wellington. The work won the inaugural Composition Competition there in 1982, being played on that occasion by Bruce Corlett (violin) & Hugh Stevenson (piano). It is a single movement work in sections of varied tempo an texture, and although tied in with the formal study requirements of the day, the piece saw the establishment of a personal harmonic language and style. In fact the composer considers that this work marks the beginning of his catalogue. Nigel Keay played the violin part of this essentially abstract piece shortly after it was written, reflecting his desire to create a work that would be enjoyed by its performers. ....... "It makes a perfect foil for Nigel Keay's "Variations", with a bluesy, meditative tune at the outset igniting a vigorous outpouring of different energies, most of them jazzily flavoured, and some hauntingly introspective. The piece powerfully underlines the fecundity of the "theme-and-variations" idea, something that was, of course, well understood by Beethoven."